The Trans Day Of Visibility Clothing Swap was a way for Humber College’s LGBTQ+ community to celebrate trans folks. Natalie Elisha, student diversity and inclusion initiatives coordinator helped organize the clothing swap for the Trans Day of Visibility (TDOV), a day that empowers and recognizes the community. The day is usually recognized on March 31, and it’s a day to celebrate the achievements and experiences of trans people instead of thinking of all the people that were lost from anti-trans gender violence, Elisha said. This year’s theme is “surviving, thriving.” TDOV was started in 2009 by Rachel Crandell to celebrate the trans community in a positive light and raise awareness about transphobia and discrimination. 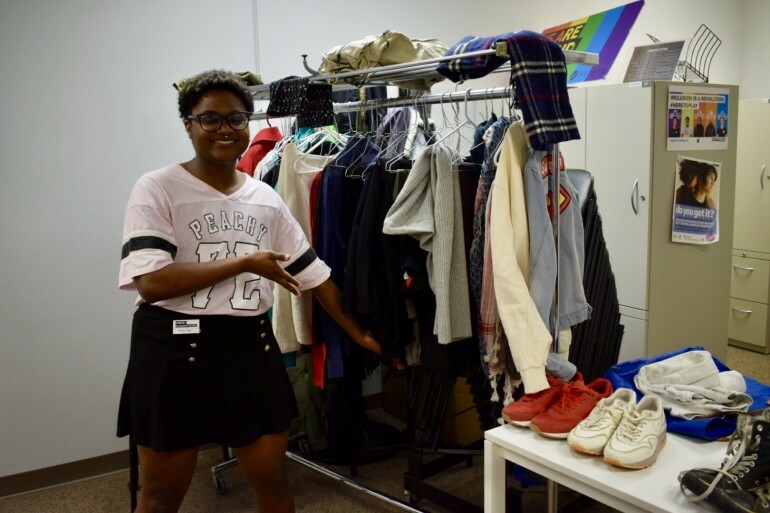 “The clothing swap specifically was intended to create a safer space for people to access clothes that they feel great in without feeling judged or uncomfortable,” she said. Clothing exchanges can give people access to clothes that match their gender expression. Kenny Dawkins, an event and resource assistant at the LGBTQ+ Resource Centre, appreciates the school’s inclusion and LGBTQ+ community that organizes and promotes these types of events. “Personally, as a trans student it makes me think about all the great stuff the community has done, and were still thriving and we are still here, and I think it’s important to remember the people that are still here instead of the people that are gone,” they said. Donations of good condition clothing were made by students and showcased at the LGBTQ+ Resource Centre . “A lot of people brought clothing to this event, there was definitely a lot of support,” Dawkins said. “After the clothing swap is finished we donate the rest of the clothes to other clothing swap places or 519, the LGBTQ+ community centre downtown Toronto, so that it can continue to be recycled and given to people who are need of them,” they said.